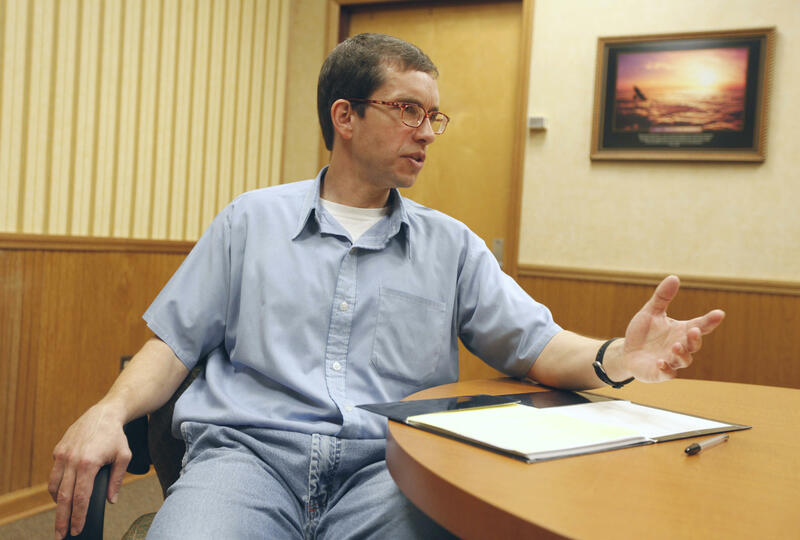 This 2011 file photo shows Jens Soering speaking during an interview at the Buckingham Correctional Center in Dillwyn, Va.
It’s been nearly two years since Jens Soering, a former honors student at the University of Virginia, asked the governor’s office for a pardon. Soering was convicted in the bloody murders of his girlfriend’s parents, but for more than 30 years he’s maintained his innocence. A growing body of evidence suggests he’s telling the truth, but the governor and the parole board have yet to decide on his request. During his trial, the prosecutor maintained that Type O blood found at the crime scene came from Jens Soering, but Virginia’s crime lab has now concluded the Type O blood samples came from another man, a fact confirmed by Dr. Thomas McClintock, the Director of the Forensic Science Program at Liberty University. “They were not anywhere close to Jens Soering’s DNA,” McClintock says. In fact, nothing from the scene of the crime connects Soering to these murders. His former girlfriend, Elizabeth Haysom, insists Soering acted alone in stabbing her parents and cutting their throats. She was convicted as an accomplice and is also in prison. 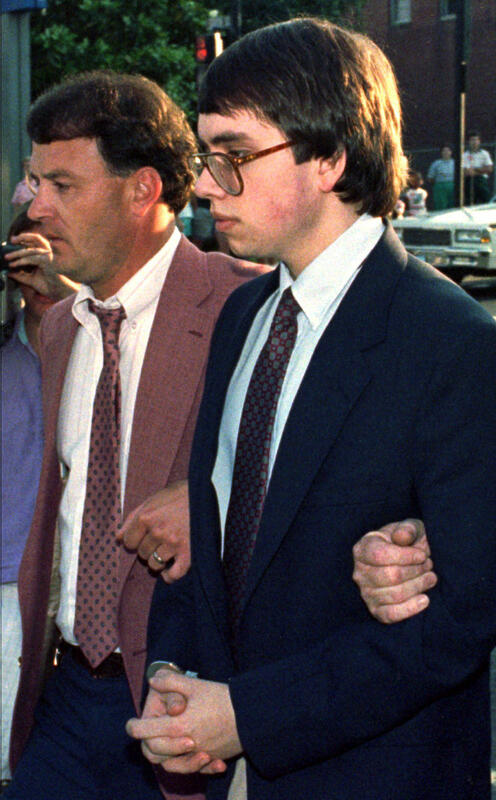 Jens Soering, right, is escorted by Bedford County investigator Ricky Gardner, after being convicted on two counts of murder in this June 22, 1990 photo. An FBI profiler, Ed Sulzbach, thought Elizabeth was probably behind the crime, but the chief detective on the case, Ricky Gardner, insisted the Federal Bureau of Investigation never did a profile. Now, retired FBI agent Stan Lapekis has come forward with possible proof of its existence. “We obtained a teletype that stated that FBI Quantico had conducted a psychological profile, and it indicated that the person responsible for the crime was close to the family. That was also shored up by the fact that Ed Sulzbach was photographed at the crime scene,” Lapekis says. The Sheriff of Albemarle County, Chip Harding, spent over 200 hours reviewing the case and was appalled that a tire track expert had been allowed to testify that a bloody sock print at the crime scene was a perfect match for Soering’s foot. One possible explanation – Soering’s lawyer at the time was incompetent. He would eventually be disbarred for mental disability and he failed to object at key points in the trial, a fact that would doom future appeals. Soering did, at one point, confess, but now claims he was trying to protect the woman he loved from possible execution. An international expert on false confessions has since said Soering was lying when he tried to take the rap. Sheriff Harding sent a lengthy letter to Governor McAuliffe before he left office, calling attention to all of these things. “To me, if I was governor and reading that I would say there was no way in the world that you could convict this guy if you gave him a new trial,” Harding concludes. But McAuliffe, a likely candidate for president, decided to leave a potentially controversial decision to his successor, and Ralph Northam has passed the buck to his parole board. We caught up with him at an outdoor festival in Albemarle County. Soering is actually eligible for parole, but he’s been rejected 13 times. The head of the parole board – Adrianne Bennett -- says his request for a pardon has been under investigation for two years, but the investigator assigned to his case has been wrapping up other matters before devoting herself exclusively to Soering’s case. She adds that many people have asked for pardons, and requests are reviewed in the order they are received.